The Toro Co., along with its longtime distributor partner, Turf Equipment and Supply Company, based in Jessup, Md., will provide a fleet of Toro stand-on aerators and volunteers to help beautify the cemetery grounds during the National Association of Landscape Professionals (NALP) event, Renewal and Remembrance. 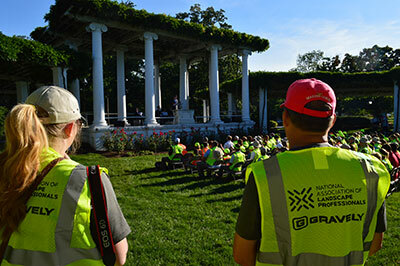 The annual event—which will celebrate its 22nd year on July 16—brings together volunteers for a day of lawn care, tree care and landscape and irrigation projects at Arlington National Cemetery. The compact 30-inch Toro stand-on aerators being provided for the event are designed for high productivity and offer zero-turn maneuverability, variable speed and reversible traction drive. In addition, Toro’s newest line of stand-on aerators will make an appearance at the event for the first time. The new 24-inch stand-on aerators are both simple to operate and extremely efficient. They’re compatible with Toro’s all-new spreader attachment, so operators can pull plugs and overseed on a single machine. NALP will hold the Renewal and Remembrance annual volunteer service event in conjunction with its annual advocacy event, Legislative Days on the Hill, on July 15-17, in Washington, D.C., and northern Virginia.